Adjust the steering wheel position before setting off and only when the vehicle is stationary. Push down the lever . Adjust the steering wheel so that you can hold it on the outside of the ring (at the 9 o'clock and 3 o'clock positions) with both hands and slightly bent arms. Push the lever up firmly until it lines up with the steering column . Incorrect use of the steering column position adjustment and incorrect adjustment of the steering wheel can cause serious or fatal injuries. 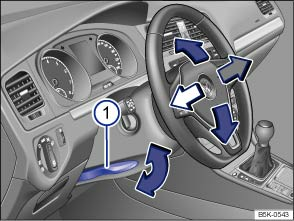 After adjusting the steering column, always move lever up so that it engages securely. This prevents the steering column from moving spontaneously while the vehicle is in motion. Never adjust the steering wheel when the vehicle is in motion. If you determine that a readjustment is necessary, stop the vehicle safely and adjust the steering wheel to the correct position. The steering wheel must always point towards the chest and not towards the face. This ensures that the driver front airbag provides maximum protection in the event of an accident. While driving, always keep both hands on the outside of the steering wheel, at the 9 o'clock and 3 o'clock positions. This reduces the risk of injury if the driver front airbag is triggered. Never hold the steering wheel at the 12 o'clock position, or in any other manner, e.g. on the hub of the steering wheel. If the driver front airbag is triggered, you could receive severe injuries to the arms, hands and head.